Rochester Police Chief Michael Ciminelli, a 1978 graduate in criminal justice, received the Contributions to Justice Award Friday at the Senior Luncheon and Recognition Celebration put on by the Department of Criminal Justice and RITâ€™s Center for Public Safety Initiatives. Rochester Police Chief Michael Ciminelli said when he was studying criminal justice at Rochester Institute of Technology, he was mostly excited about becoming a police officer, but not so much about the science of enforcing the law. Ciminelli, who graduated from RIT in 1978, made his remarks Friday as he received the Contributions to Justice Award at the Senior Luncheon and Recognition Celebration put on by RIT’s Department of Criminal Justice and Center for Public Safety Initiatives. The event also recognized 20 RIT criminal justice majors. After graduation, Ciminelli worked with the Monroe County District Attorney’s Office, the Drug Enforcement Administration and police departments in Elmira and Rochester, where he has been chief since 2014. 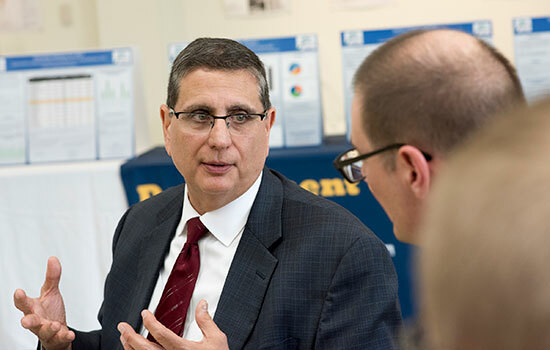 Ciminelli thanked RIT for the work it does through the Center for Public Safety Initiatives, which conducts research to help improve the criminal justice system in Rochester, across the state and nationally. Melissa Burmester of East Moriches, N.Y.
Liam Fanning of Commack, N.Y.
Abigail Hallowell of Rochester, N.Y.
Luca Ignatowski of Austin, Texas. Dylan Buchholz of Fort Montgomery, N.Y.
Rhianna Hayes of Canandaigua, N.Y.
Jessica Burt of Hamlin, N.Y.
Alexis Pawluk, a third-year student from Naples, N.Y.
Chaquan Smith of New York, N.Y.
Jose Gratereaux De Los Santos of Victor, N.Y.
Nathaniel Le Mahieu of Hortonville, Wis.
Luisa Swan of Liverpool, N.Y.
Christopher Sweadner of West Hartford, Conn.
Aaron Baxter of Oswego, N.Y.
Keith Ericksen of Evanston, Ill.
James Herrman of Slingerlands, N.Y.
Tayler Ruggero of Langhorne, Pa.